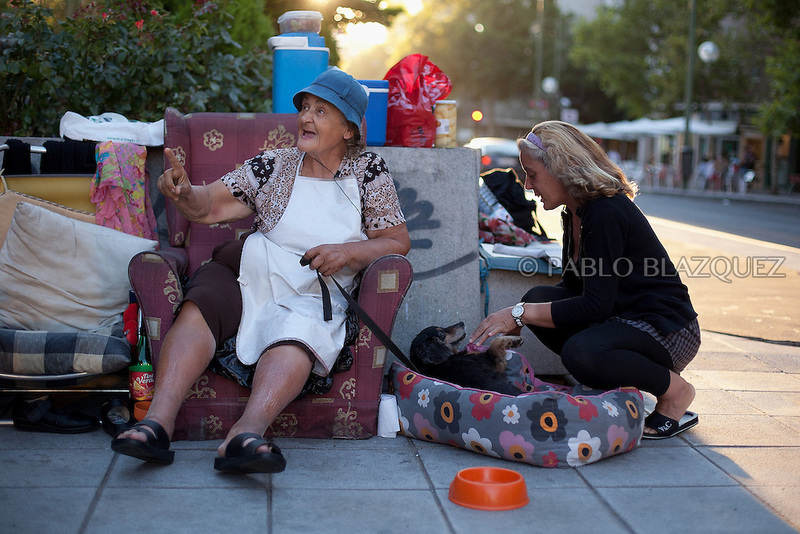 (L-R) Carmen Castilla 77, chats with a neighbor while her daughter Rosa Maria Sastre Castilla 46, plays with her dog Toni in the street on September 3, 2012, in Madrid, Spain. The family of four were evicted from the flat they were renting on April 24th, after Rosa lost her job and the main income of the family. They couldn't afford to pay anymore their rent. Social Services provided with temporally shelter for 15 days, but after that they found themselves living in the street. They have wrote to the Spanish Prime Minister, the King, the Prince and the Queen of Spain, the President of Madrid but all answers received were saying that they were really sorry about their situation but there was nothing they could do on their hands, referring them to the Social Services. They have registered their census in a piece of street of Madrid. Neighbors often give them a hand providing food, blankets, charging mobiles or making their laundry. The family lives of their mother's widow's pension, some money they get from visually impaired Antonia's welfare allowance, and whatever income the sister Carmen Aurora can get working as a concierge at a nearby building.They sleep rough in a store front door nearby. Carmen 77, with back and heart problems, sleeps sitting on her armchair as she is not able to stand up from ground level if she would sleep on top of a mattress.